Boil corn 5 minutes in a pot of salted water. Drain and rinse under cold water to cool. With a sharp knife, cut kernels from cobs. Transfer to a bowl and toss with jalapeno, scallion, cilantro, avocado, 2 tablespoons oil, and juice of 1 lime. Season with salt. Combine chili powder, 2 teaspoons salt, 1/2 teaspoon pepper, and remaining 2 tablespoons oil. Place plastic wrap over pork medallions and press each to flatten to about 1/2 inch thick. Brush both sides with chili mixture. Heat a grill or grill pan to medium-high. Clean and lightly oil hot grill. Grill pork 3 to 4 minutes per side for medium. Remove from grill and squeeze juice of remaining lime on top. 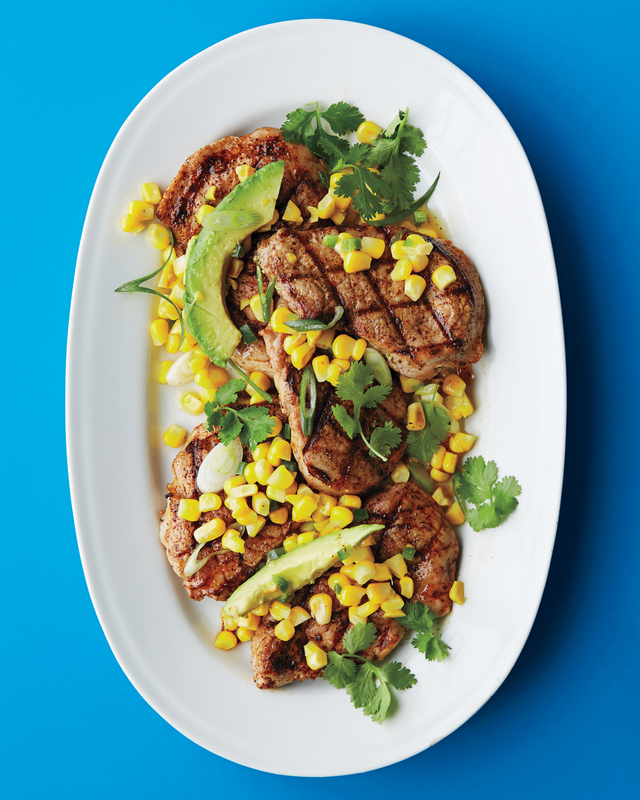 Serve with corn salad.